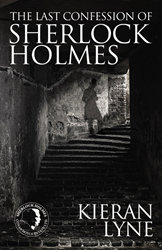 At just 23 years old, Kieran Lyne is one of the youngest writers ever to receive the Conan Doyle Estate seal for his new novel, The Last Confession of Sherlock Holmes. Lyne had the perfect credentials for tackling a Holmes novel having studied History. Steve Emecz MD of MX Publishing Quotes: Kieran’s take on the Ripper story is refreshingly new and very well linked back into the original stories. There has never been a better time to be a Holmes fan. However, he almost took another path, into music. (http://www.waterstones.com/waterstonesweb/products/kieran+lyne/the+last+confession+of+sherlock+holmes/11070423/) , and Book Depository who have free worldwide shipping (http://www.bookdepository.com/Last-Confession-Sherlock-Holmes-Kieran-Lyne/9781780926568).